‘One of my father’s and my mother’s greatest gifts to me was our home in Goa,’ said Sanjna Kapoor at the theatre seminar organised by the Hauns Sangeet Natya Mandal, Ponda and the Directorate of Art and Culture, Goa. Recalling childhood experiences of coming here since the age of three, she said, ‘My first earning…25 paisa…was from selling fish in Mapusa market.’ The progeny of the illustrious Kapoor family was happy to be in Goa to talk about why theatre matters to her. As time goes by and society is transformed, the reasons for the existence and significance of theatre change too. As she addressed an audience mainly composed of teachers, Sanjna expressed her dream of finding theatres in every neighbourhood and seeing teachers upheld as heroes alongside film stars and cricketers. This would truly be a result of our culture that we can take pride in. Geoffery Kendal, Sanjna’s grandfather, came to India during World War II to entertain the British troupes. He fell in love with India and consequently returned, never to go back to England. He, along with his theatre company Shakespeareana, wife Laura Kendal and daughter Jennifer, travelled across India for forty years, putting on modern classics as well as Shakespeare in theatres, schools and colleges with very simple sets and designs but great performances. ‘This was his adventure: he lived, breathed, smelt and ate theatre,’ she said of Geoffery Kendal, who withdrew his daughter Jennifer from school to bring her to India, which would become her lifelong education. Her father Shashi Kapoor joined the company later on. In 1944, when India was on the verge of attaining freedom and Prithviraj Kapoor (the father of Shashi Kapoor), was at the peak of his acting career, he invested all his money in creating Prithvi Theatres. The Hindustani plays were about the political, economic and social circumstances of the period, such as the effects of capitalism, the plight of farmers and the partition of India. In sixteen years there were eight productions, after which the company had to close down due to Prithviraj Kapoor’s ill health. Years later, Shashi Kapoor and Jennifer Kapoor would revive Prithviraj Kapoor’s dream by building Prithvi Theatre in Juhu on the original site of Prithvi Theatres. 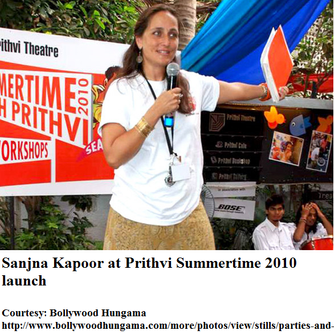 This is where Sanjna Kapoor received her theatre education. The Government had promised more land to the Kapoors for the expansion of the theatre but this never came to fruition. Shashi Kapoor gave all of his time, money and energy to make it work in the face of sleepless nights for the lack of funds. Using this fervour as an example, Sanjna urged the audience to take it up with the Government to ensure spaces for the dramatic arts. To ensure the survival and growth of a cultural organisation, it is vital to join hands with other groups. Therefore, together with its regular programming, Prithivi Theatre has partnered with TIFR (Tata Institute of Fundamental Research) to have monthly forums called Chai & Why to discuss scientific ideas in an informal setting. There is a partnership with Thespo to promote youth theatre at Prithvi Theatre. Prithvi and Vikalp have come together to screen short films and documentaries. Besides these there are a number of other collaborations. 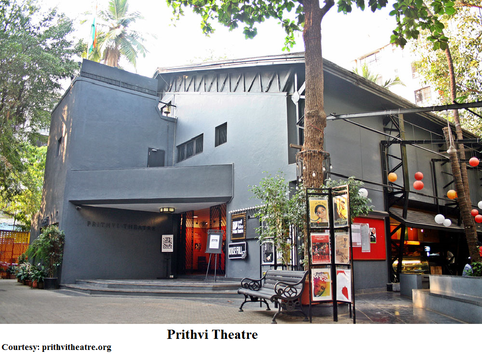 Prithvi Theatre showcases plays in Hindi, Marathi, English and Gujarati, though the focus is primarily on Hindi theatre. It has over 550 shows a year, from Tuesday to Sunday. Apart from this it has its annual Prithvi Theatre Festival and Memorial Concert. Theatre workshops are held here too and in the summer special emphasis is given to activities and plays involving children. When the Planning Commission asked Sanjna to send them a report about the success of Prithvi, she refused to do so on the grounds that the Government has done nothing whatsoever to make it possible or further the cause of theatre in anyway. We have inherited the British system of supporting the arts among other things, and the arts have always been supported in our country by the religious institutions, kings, landlords and the like. However, our Government has been prominent in its inertia in these times. Sanjna says, ‘Our Government needs to understand that we need to nurture…we need to sow seeds…we need to create fertile soil from which a forest of theatre activity can emerge in this country.’ Noting the richness of every culture in this country, she gave an example of cultural activities abounding in each state in the events taking place at Ninasam, Karnataka, where K V Subbanna brought world literature, world theatre and world intelligentsia to his village rather than the other way around. After 25 years of Prithvi, Sanjna felt there was much more they could achieve, and instead of the usual celebrations, India Theatre Forum was born to bring together theatre folks from across India. The ten year old organisation has seminars every three years, publications, research projects and a study tour, wherein people are invited to stay with the theatre group and experience the life of that theatre. They have also started a programme called Strategic Management in the Art of Theatre. Sanjna Kapoor read aloud the Manifesto of the Arts which she found on Facebook– ‘Art epitomises the irrepressible human need for the immaterial things that matter; love, friendship, home, family, ideals and the pursuit of knowledge and goodness. Culture, of which the arts are the highest expression, is but a collective means of making meaning, of telling stories, of imagining and believing what is real, who we are, what we are doing here and why. Our culture reflects us; how we see the world and how the world sees us.’ The fear of India turning xenophobic and violent was expressed. There must exist the ability to celebrate another’s difference – not tolerate it. This sort of an atmosphere can come into being only by cultivating the arts. South America has been progressive in the area of the promulgation of the arts through the SESC (Social Service of Commerce), Brazil and El Sistema, Venezuela. These are programmes that have touched and transformed children’s lives completely through the arts. They encourage a sense of belonging and engagement unlike any other subject or sphere of study. ‘When you work with children in school you can touch a child directly and give them a sense of self-worth and dignity,’ says Sanjna. Junoon Theatre was begun by Sanjna Kapoor and Sameera Iyengar. It organises conversations with artists where a specific aspect of their work is discussed with the public. There is a school programme of five days. Here they take the children to view a professional play and have them talk about it. They have workshops with the teachers and children, the children meet the artists and on the last day the children get to exercise their creativity. Junoon, furthermore, wants to have regular performances in public gardens, but the onus of this is on the neighbourhood. There are other programmes as well in the effort to revitalise our society’s culture and help envision a better tomorrow for India…an India that authentically reflects our glorious culture.